Nicole's Yankees Blog: Get your brooms out! Today ( September 22), the Yankees capped off their sweep of Baltimore with a 7-6 victory. Also big news from the Stadium is that the Yanks are in FIRST PLACE! That is right! Yesterday (September 21), the Yankees had beaten the O's, and Boston had lost in Tampa Bay to the Devil Rays. This put the Yanks one half game up in the division. Tonight, the Yankees finished their sweep of Baltimore and Boston had off, making the Yanks one full game above the Red Sox for the division lead. This is great news for the Yankees, as I have mentioned before that every game counts for them. Mike Mussina (a pitcher nicknamed the Moose) also returned to the starting lineup for the Yanks after an injury. I would post some more pictures, but the feature is not working as I had hoped as of yet. I will keep you updated on the Yankees status in the playoffs! Go NY! 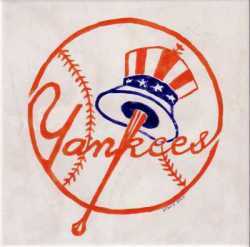 I am so excited that the Yankees are finally in first place!! Everyone is always trying to hate on the Yankees- but that is just because everyone knows that they really ARE the best team- and sometimes its more fun to root against them than for them. But you already know what an avid Yanks fan I am and I actually have the game on right now!! I know deep down that the Yankees will win the World Series this year- and anyone who believes differently should shut up. Right? Anyway I would love if you put some more pictures of A-Rod up- because that would definitely keep me coming back to your website- and definitely keep putting up the standings- I love to read that the Yanks are in first place! Finally! The Yankees haven't been in first for so long I almost forgot what it felt like to be a fan of a first place team. I was very happy to see the Yankees sweep Baltimore. Their pitching and hitting came together very successfully and they looked like a winning team. They looked like the old Yankees. I'm glad the Yankees are one game above the Boston Red Sox, but I definitely think the Red Sox need to keep losing and the Yankees need to keep winning. Because a one game lead is not a big enough lead in any division, especially one with the Red Sox. I'm glad Mike Mussina is finally back in the line up. I just hope he pitches well and is consistent, because when he is good, he is really good but when he is bad he is absolutely terrible and usually doesn't even last three innings. Lets hope he is back to the old Mike Mussina because we will really need him if we make it to the post season.